XPB Lockers inventories an extensive selection of mailbox posts for a variety of residential mailbox designs. XPB Lockers mailbox posts are designed to withstand extremely high winds and are composed of the finest dye cast aluminum, and finished with sturdy powder coating that enables them to stand up to both hot and humid climates such as Florida or Texas and exceptionally cold climates like Wisconsin or Washington State. XPB Lockers mailbox posts attributes include two layers of coating, each applied with a highly specialized, proprietary process that will give you piece of mind about your investment. Mailbox posts are dye cast in aluminum molds then processed in an acid cleansing bath and ultimately cleansed with high pressure compressors before powder coating finish is applied. Powder coating is then applied at an extreme temperature that bonds the aluminum and protects the post from salt, oxidizing materials and other airborne products. These decorative mailbox posts are ensured with a manufacturer’s warranty. If you are looking for the best value with the maximum protection without maintenance for your investment a residential mailbox posts design, our cast aluminum posts lead the way and set the standards for the competitive edge. XPB Lockers residential mailbox posts are designed to enhance the visual landscape of your mailbox site just as much as they are designed to withstand extreme temperatures and high winds. 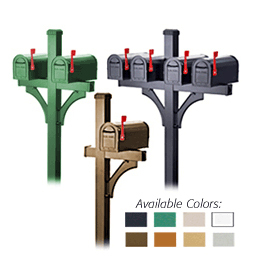 For our customer who wants their mailbox post to enhance their mailbox and also to blend in with the natural surroundings, you can, you can order cast aluminum residential mailbox posts in selection of designer colors to match many mailbox designs. For rural areas we offer mailbox posts that fit two or more mailboxes, great for duplexes and residential areas where required. Feel confident that your choice in a decorative mailbox posts made from cast aluminum will withstand the test of time. Ask to speak to a professional if you are struggling with a decision on the best support for the design for your residential mailbox. Landscape designers will tell you that the details are what bring the entire setting together and while only a small part of the full design; your choice of a decorative mailbox post can complete the appearance of your landscape. XPB Lockers wants to empower our client with optional mailbox post design options. Certain features are common to all of our designs to ensure U.S.P.S. compliance codes. Decorator mailbox posts feature one-piece solid construction and are made from dye cast aluminum a light weight but durable aesthetically pleasing metal to provide uniformity. Each mailbox post mounts easily to mailbox units and a variety of mount applications are offered. This offers a strong competitive advantage over many other mailbox post designs. Our growing U.S.P.S. approved inventory as well as our high grade business and residential sector product lines are offered in the latest designs. Round and Tapered, Straight and Fluted, our designs, as well as a wide range of attributes offer you the optimum choice of in mailbox post designs and are sure to meet the practical demands through the aesthetic preferences of each individual client. If you are looking for a variety of products with simple solutions to your area planning, whether you are shopping for a decorative mailbox post or another type of residential, commercial, industrial or code compliant product from our diverse expanse of product lines, we work with individuals, schools, churches and professional business organizations in planning and proposing best choices that fit each budget but never compromising value. XPB Lockers mailbox posts and variety of mailboxes, both residential and commercial, can help to eliminate the unnecessary cost of specialty and customized equipment. Ask an XPB Lockers specialist about available warranties, products and ideals that best fit your equipment requests. Let XPB Locker’s Help You! XPB Lockers carries a wide variety of commercial mailboxes, lockers, outdoor furniture, commercial lavatories and bleachers with professional affiliates to help with installation where available. If you cannot find what you are looking for, please call us toll free at 1-877-483-9270 and we will be pleased to help find it for you. Our home office is located in New Braunfels, Texas with warehouses located throughout the United States that enable us to service all 50 states including Seattle, Washington, Chicago, Illinois, Baltimore, Maryland, Pasadena, Texas, Amarillo, TX, Brownsville, Texas, Grand Prairie, TX, Pasadena, Texas, Fort Worth, Texas., San Antonio, Texas, Salisbury, N.C., Milwaukee, Wisconsin, Boston, Massachusetts, Salt Lake City, Utah, Billings, Montana, Tulsa Oklahoma, and Los Angeles, California. 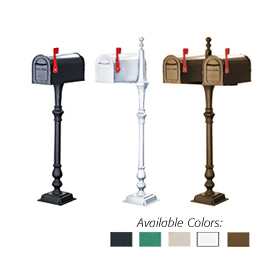 Pedestal mailbox stands and posts for cluster mailboxes and pedestal mailboxes.